Join the Concord Chorus, now in its 73rd season, for a heavenly selection of music and carols for the holiday season. 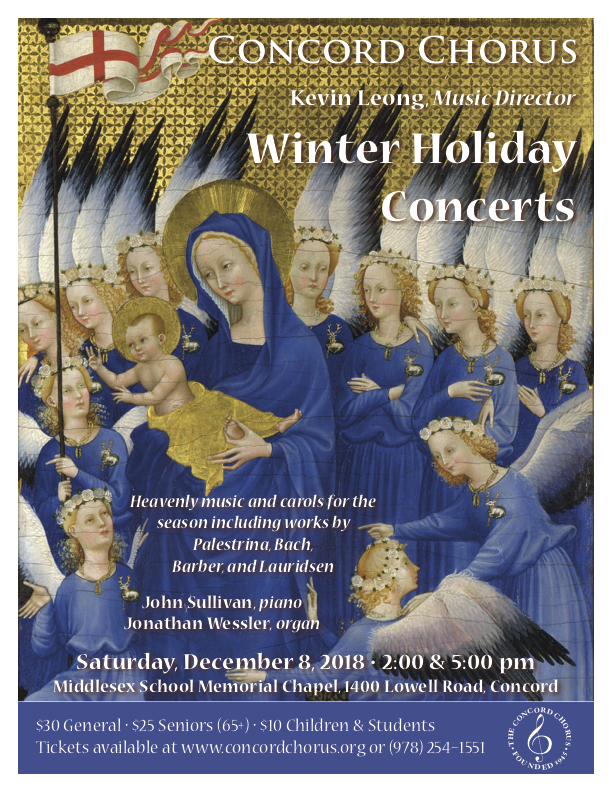 Kevin Leong conducts the 110-voice Concord Chorus on Saturday, December 8, 2018, at 2:00 PM and 5:00 PM at the Middlesex School’s Memorial Chapel (1400 Lowell Road) in Concord, Massachusetts. The program spans five centuries of choral music, including works by Palestrina, Bach, Brahms, Barber and Lauridsen, and favorite carols. The concert also features organist Jonathan Wessler and pianist John Sullivan. Tickets are $30 for general admission, $25 for seniors, and $10 for children and students and can be purchased online at www.concordchorus.org or over the phone at (978) 254-1551. Founded in 1945, the Concord Chorus performs two concerts of choral-orchestral and smaller works each season. The repertory of the Concord Chorus encompasses music from the 16th century to the present. For more information, please visit www.concordchorus.org.